Dr. Ryan Reuter of The Noble Foundation shares what you can do to become a good stock handler. A common misconception is that “low-stress” must mean “no pressure.” That is absolutely false. Cattle, like all other animals, respond to appropriate application and release of pressure. There are times when significant pressure must be applied to get the animals to move how and when you need. Pressure, used appropriately, does not cause long-term, harmful stress. A good cattle handler understands two key principles: flight zone (the “bubble” around an animal that, if invaded by a handler, will cause the animal to move away) and point of balance (the point, usually around the front shoulder, at which pressure in front of that point will cause the animal to stop or back up, and vice versa). When a stockman is at the edge of the flight zone and properly balanced, only slight movements are needed to control the animals in a low-stress manner. To make cattle speed up, walk against their direction of travel; to make them slow down, walk with them. As you pass the point of balance, notice how each animal responds to your movement and position. A good stockman will stay quiet when working cattle. If cattle aren’t doing what you want, it is not because they can’t hear or see you. It is because you are in the wrong place doing the wrong thing. Don’t yell and scream, and don’t make wild movements. Move calmly, purposefully and in straight lines. Cattle will be able to predict your movements and respond appropriately to them. If you move like a predator (hesitating, followed by sudden movements and in curves around them), the cattle will treat you like a predator. A good stockman is patient. The cattle don’t care that you are late for dinner. Keep doing the right things until the cattle respond correctly. After you have mastered the art of stockmanship, you can usually work cattle quickly when you need to. But realize that if you make cattle do something before they are ready to do it, then it is no longer low-stress handling. Ag Research Associate Kent Shankles demonstrates proper cattle sorting technique at the Noble Foundation’s Oswalt Road Ranch. 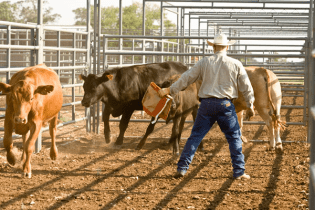 Proper positioning and use of pressure reduces stress while handling cattle. Train cattle how to behave every time you are with them. Go to the pen or pasture, and use these techniques to just move them around, teaching them to respond. If possible, move cattle through your corrals on their way to feed or to another pasture. Always make your cattle walk past you, single file, out of a gate. Don’t let them run wildly, or they will hurt themselves and you, tear up your gates and be stressed when they finally stop. When moving cattle from a pasture, ignore the few cattle that quit the herd. If you drive the main herd in a low-stress manner and don’t chase the few on the edge, they will usually come back to the herd of their own volition. Work to incorporate these habits, and they will make you a better stockman. 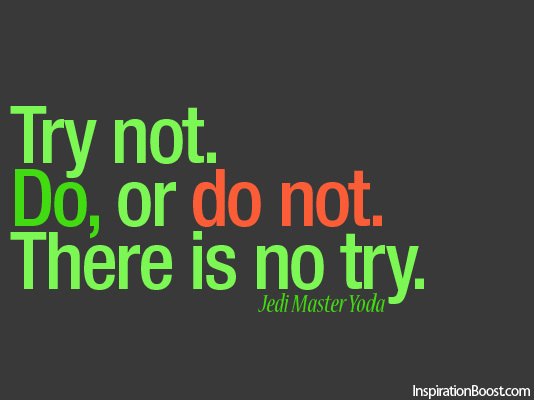 And don’t say, “I’ll try.” “Try” is an excuse to fail. The purpose of The Samuel Roberts Noble Foundation is to advance agricultural science and practice by conducting field and laboratory research, and by providing consultation to farmers, ranchers and land managers in the Southern Great Plains. Through its operations, the organization is committed to conserving and improving the soil, and fostering sustainable agricultural practices. In the philanthropic spirit of Lloyd Noble, the Noble Foundation also supports worthy charities through a program of grants with the aim of building stronger communities. Dr. Reuter serves as an associate professor on the Agricultural Division's Agricultural Research Team as well as a livestock consultant in the division's consultation program. His expertise is in forage nutrition of beef cattle and stocker cattle management. Reuter returned to the Noble Foundation in 2007 after leaving to complete his graduate education. From 2000 to 2005, he served as a livestock consultant for the Agricultural Division. He is a certified professional animal scientist (PAS) by the American Registry of Professional Animal Scientists.